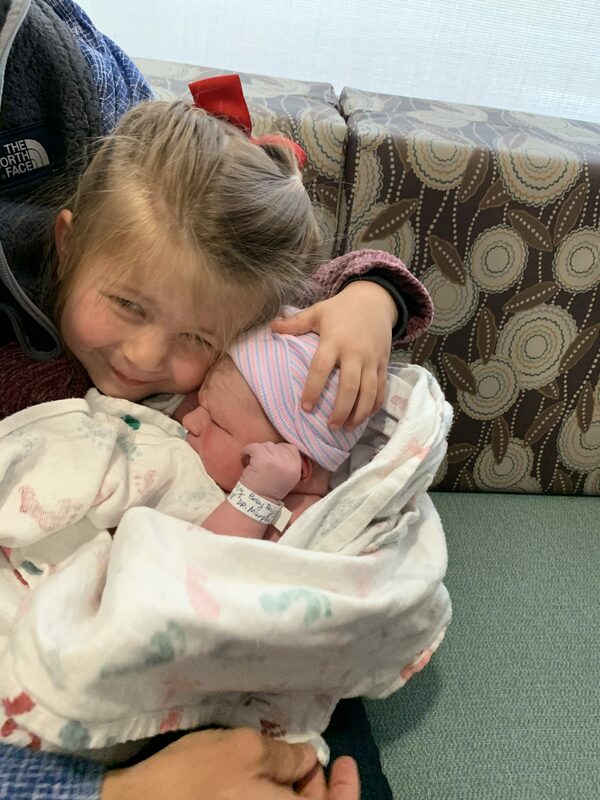 Our baby boy is here!! 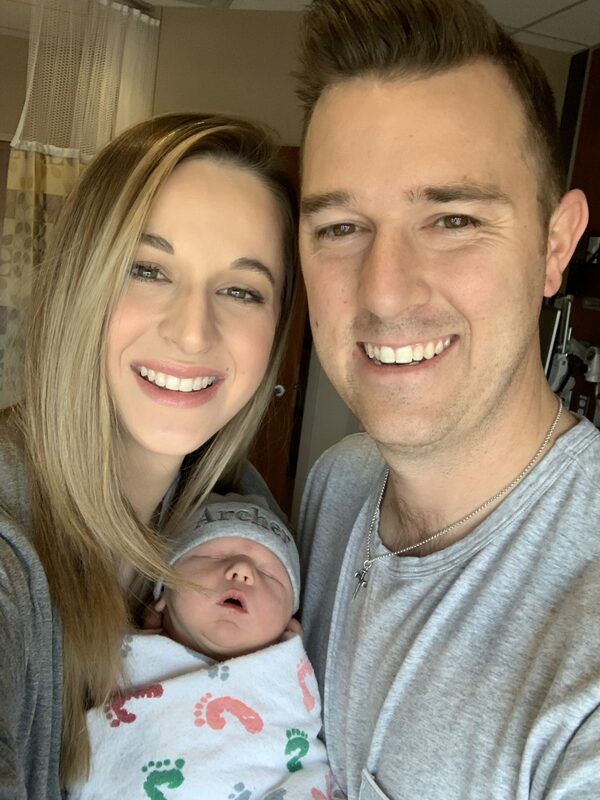 We are so in love with this little guy and our family feels complete with him being at home with us. 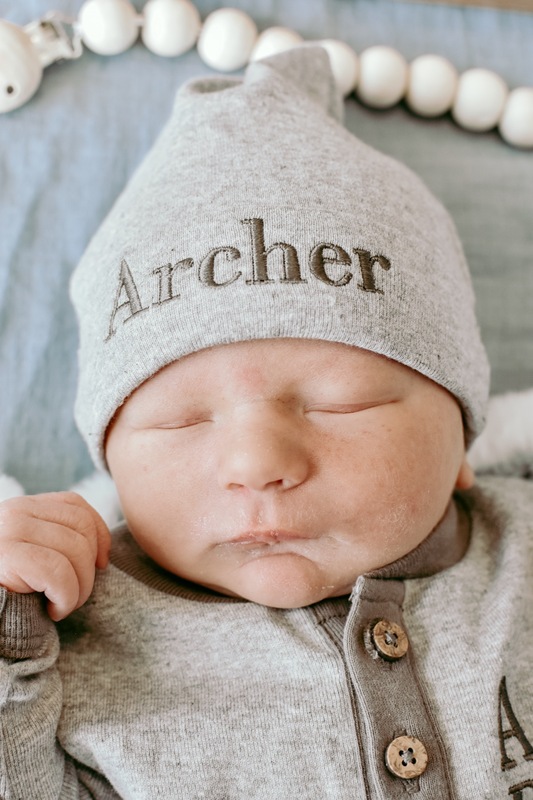 Archer’s birth story feels like it was straight out of a movie scene and when I imagined writing this blog post, I thought it would be a lot different than what I’m going to be sharing with y’all today, haha. 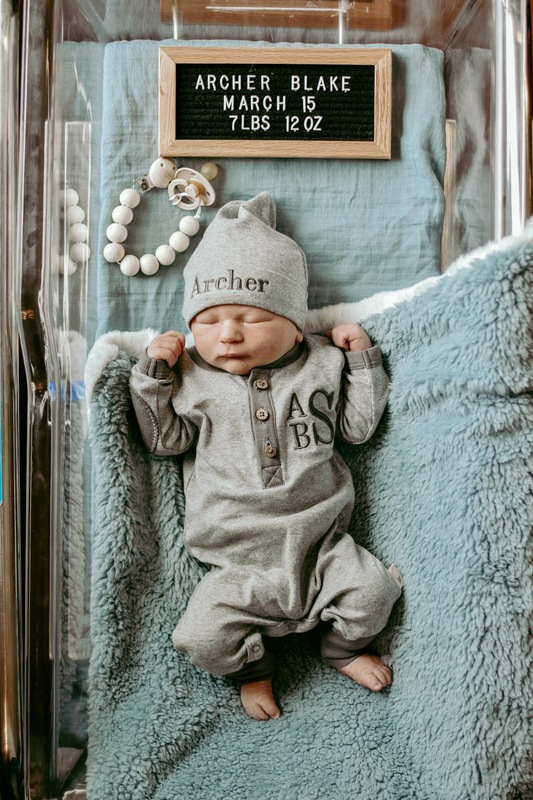 The plan was to be induced at 39 weeks with Archer, so after my last doctor’s appointment we planned the induction for Monday, March 18th. 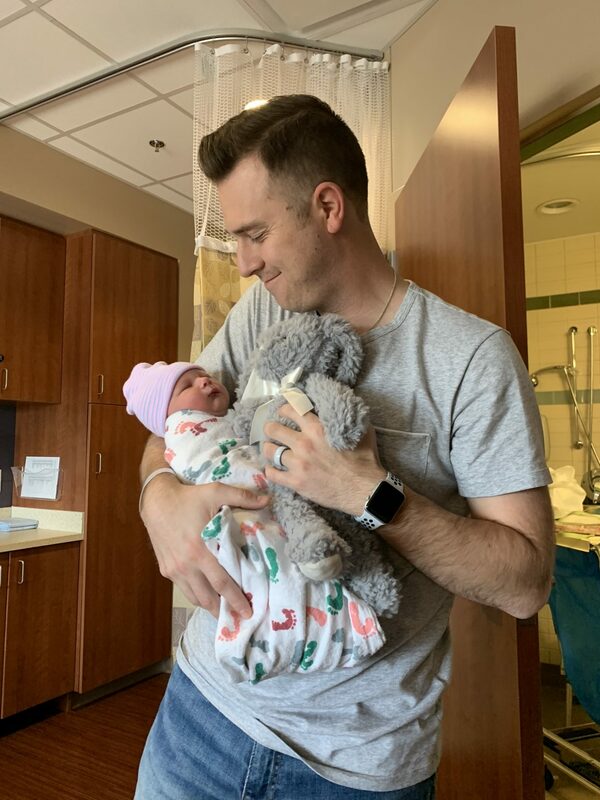 The plan was to go into the hospital on Sunday evening and since I was induced with Aria at 41 weeks exactly, I was sure that I wasn’t going to have this little guy on my own. On Thursday night I started having mild contractions that were strong enough to wake me up but weren’t coming on regularly yet so I was falling back asleep in between them. 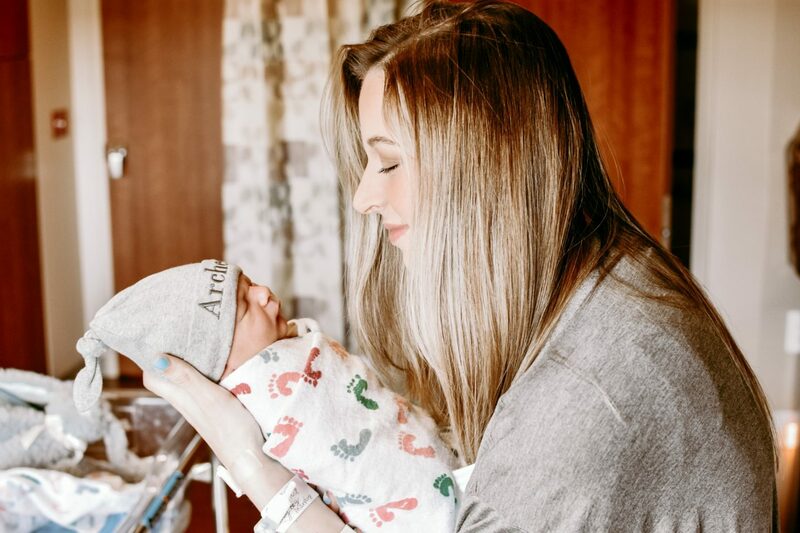 At around 4 am on Friday morning I started to have pretty strong contractions to where I was wide awake, so I decided to start timing them and I called my mom to let her know to be ready in case I needed her to come over to stay with Aria. By 5:15 am I had already had 18 contractions so they were measuring about 3-4 minutes apart on average. I called into the hospital to talk to a nurse about what I was experiencing because I really didn’t want to go into the hospital and be sent home (which happened to us when I was pregnant with Aria) and they didn’t encourage me to come in. 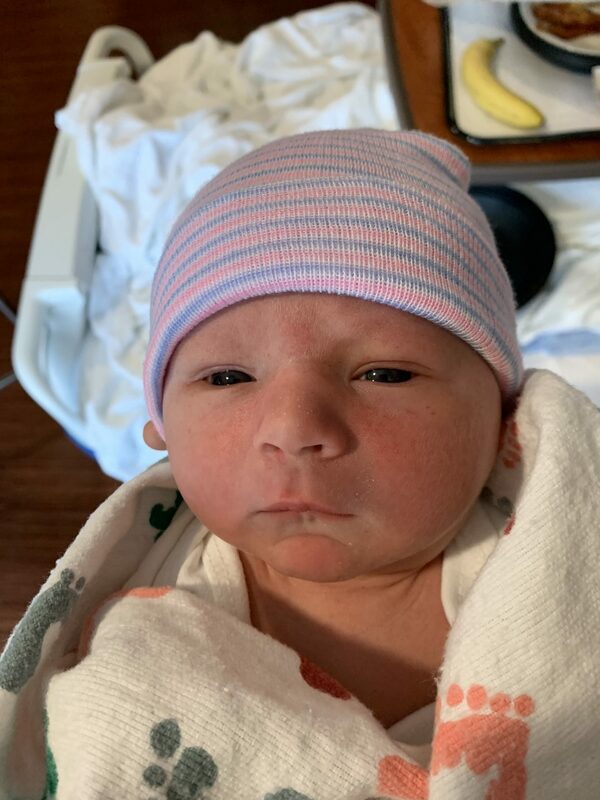 Instead, they told me that if I was in labor that I could labor from anywhere and that they were just going to put me in a bed… whatever that means. The nurse also encouraged me to drink two full glasses of water and take a hot shower and see if the pain still persisted. I did both and while I still had contractions, I tried to lay down for the remainder of the night. From about 5 AM to 7AM my contractions spaced out a bit but got even stronger and more painful. I continued to time them and they were anywhere from 5-8 minutes apart. By the time it was 7:45 AM I was so over it and decided to send my doctor a message telling her what I was going through. Within 20 minutes I received a call from a nurse at my doctor’s office who asked me what I was going through and she said it was time to come in. I immediately called my mom and told her to head this way because we didn’t want to have to mess with loading up Aria and getting her ready. Aria was awake already and Blake decided to make some breakfast so that I could get some energy in me before we left. 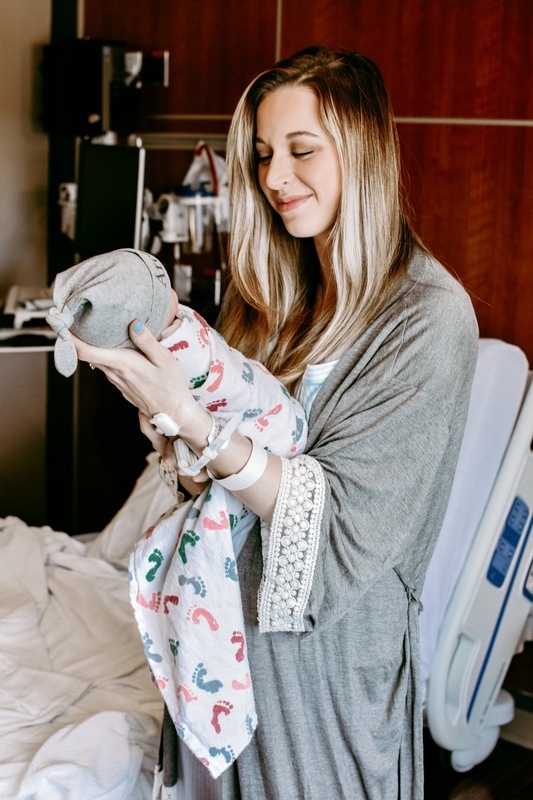 I did my best to get dressed and make sure all of my stuff was put together but as we continued to wait on my mom to get to our house (they live 20 mins away) the contractions got unbearable to where I was screaming more and more every time. Aria must have thought I was crazy and I think she was confused. We finally left the house at 9 AM with all of our stuff and as we left the house I was crying from the pain. The hospital was about 25 minutes away so you can imagine how that went. Each contraction got worse and worse, and at one point I swear I could feel myself opening up LOL. Like, I thought he was going to come in the car you guys. 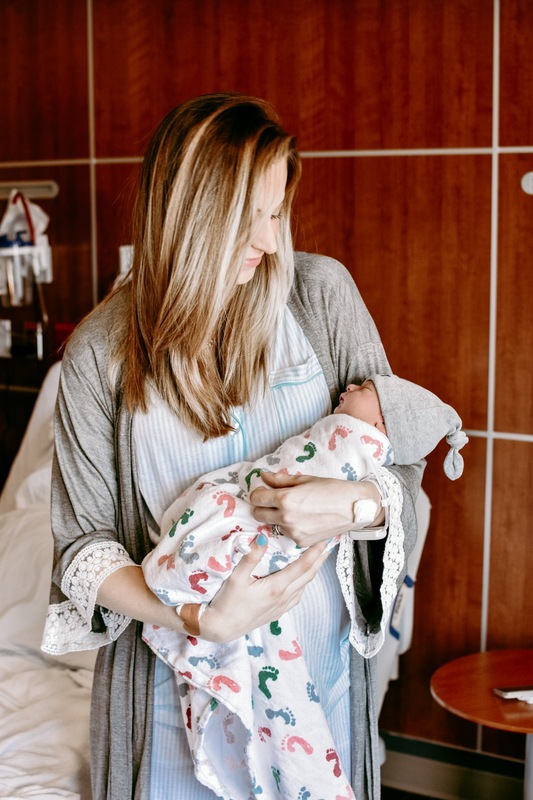 All of these feelings were completely new to me because I was induced with Aria and never felt much actual labor past being dilated to like a 4. 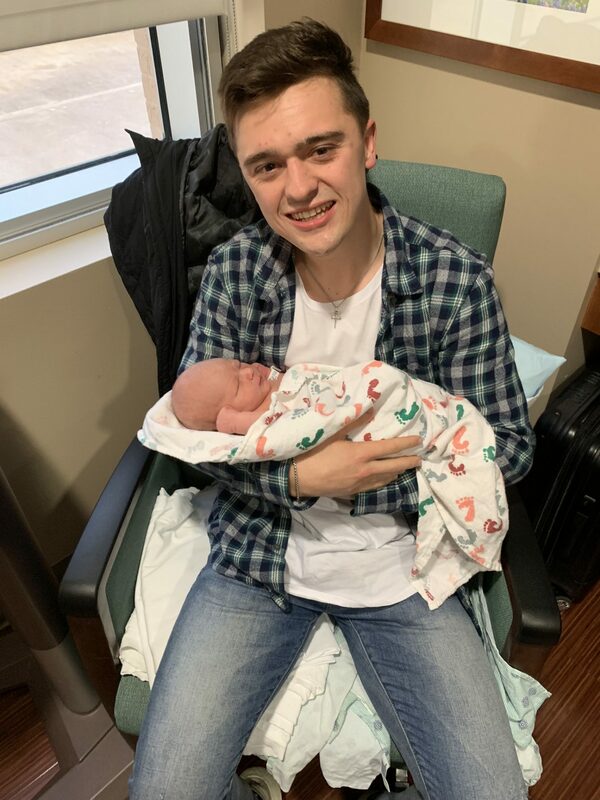 We got to the hospital at 9:30 AM and I was balling my eyes out through a contraction as Blake wheeled me up to the third floor for Labor and Delivery. My doctor had informed them I was coming so they were expecting me. Blake had left the car running so he handed me off to the nurses and went back downstairs to move the car while the nurses took me to a room and basically had to undress me and put the hospital gown on me while I had another contraction. 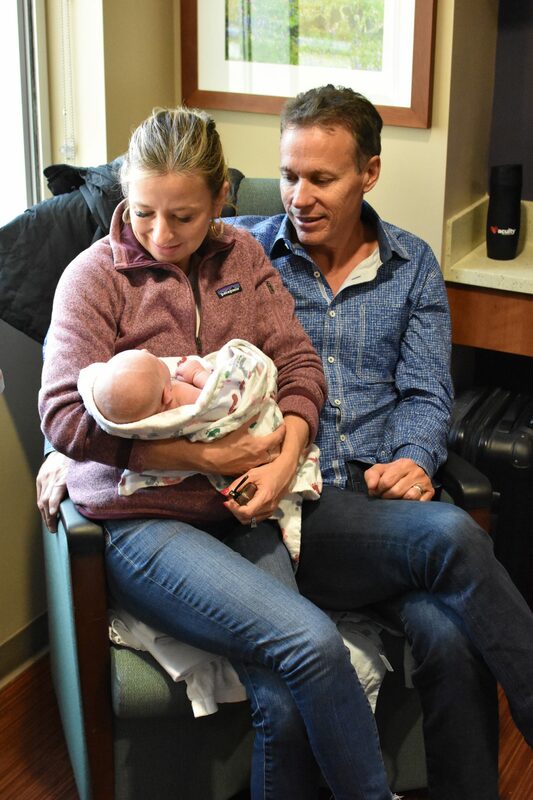 Of course the first thing I said was, “I need an epidural…now!” but they had to take certain steps before giving me an epidural like getting my IV in, checking to see how dilated I was and taking my blood. I was dilated to a 7 and was screaming in pain when Blake got back to the hospital room. I remember being so scared of each contraction as I felt them coming on again. Each one was worse and worse than the one before and I knew that as the anticipation of each was terrifying. I kept asking, “Did I get here too late for the epidural?” and no one could really give me a straight answer. The nurses would respond with, “We’re trying honey…” Side note: My nurses were so freakin amazing, and I was so happy with how sweet and supportive they were towards me. I felt like an insane person the entire time so their patience and calming presence was so good for me. Another phrase that was said to me pretty often was, “If you feel the need to push, tell us.” I had no idea what that meant but they said I would know. I was holding Blake’s hand the whole time just crying and he was so amazing and strong for me. 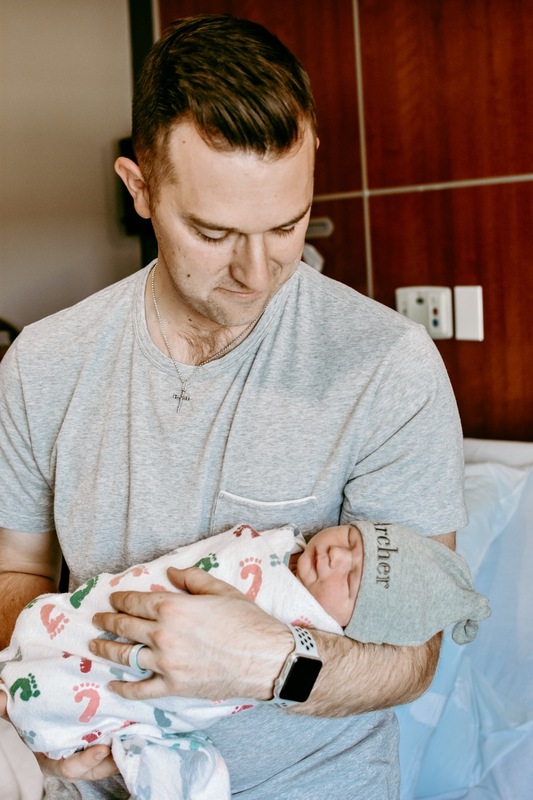 I was so scared and he kept telling me that I could do it without the epidural if I had to… I couldn’t imagine going through that without him. I could tell that the pain I was going through was hurting him as well. Next thing I knew they were measuring me again and said I was at a 10 and fully effaced and my doctor was on her way. I later heard from my mom that she saw my doctor running through the hospital to get to me on time, which scared my mom haha. My doctor made it just before I started to scream through another contraction and broke my water. This time, I figured out what the nurses had meant by when I’m ready to push I’ll know because there was so much pressure in my bottom that it was unbearable and I was screaming “GET HIM OUT OF ME!” …I think this phrase was used a couple of times and I felt like an insane person through it all. I don’t think I’ve ever screamed as loud as I did in these moments. I’m sure some of the other patients and their family members got a kick out of hearing it all go down! 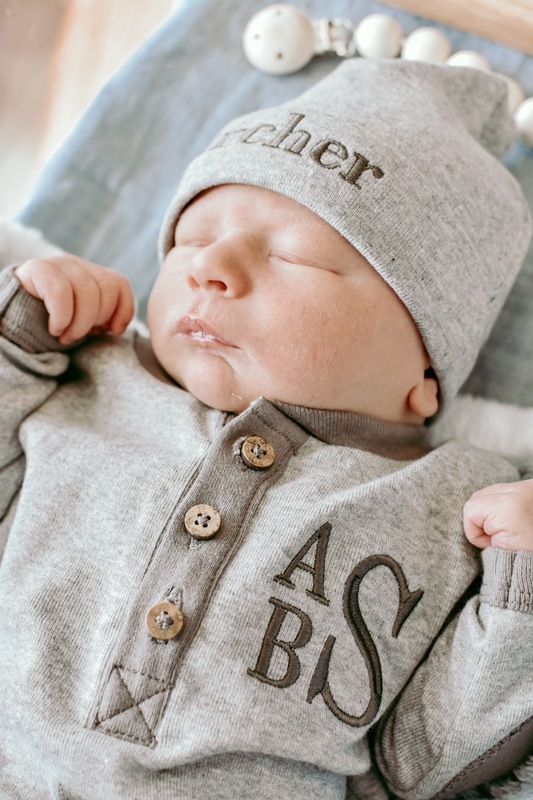 Within two pushes little Archer was here and they were the most difficult “pushes” of my life but I gave it everything I had because it was just too painful to bare for any longer. I think back to that moment and wonder how women go through natural labor without painkillers if it lasts any longer than two pushes, haha. I was so thankful he came so quickly! 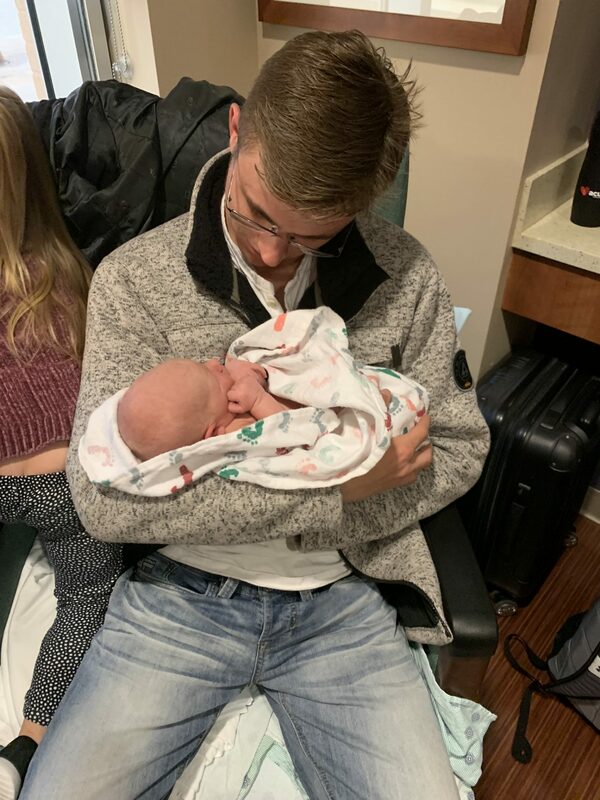 As soon as he was out I was in too much pain to hold him and that’s all I could think about. I kept saying “it still hurts…” to my doctor and she informed me that I had a second degree tear. I tore with Aria too and Archer was bigger than she was, so not surprising. My doctor continued to help me deliver the placenta before giving me two shots of lidocaine and stitching me up. During this time they were clearing out Archer’s nasal passages and his mouth and just making sure he was all good. I finally came down from the pain when they gave me a little Stadol in my IV and held Archer for the first time. He was so little and sweet. 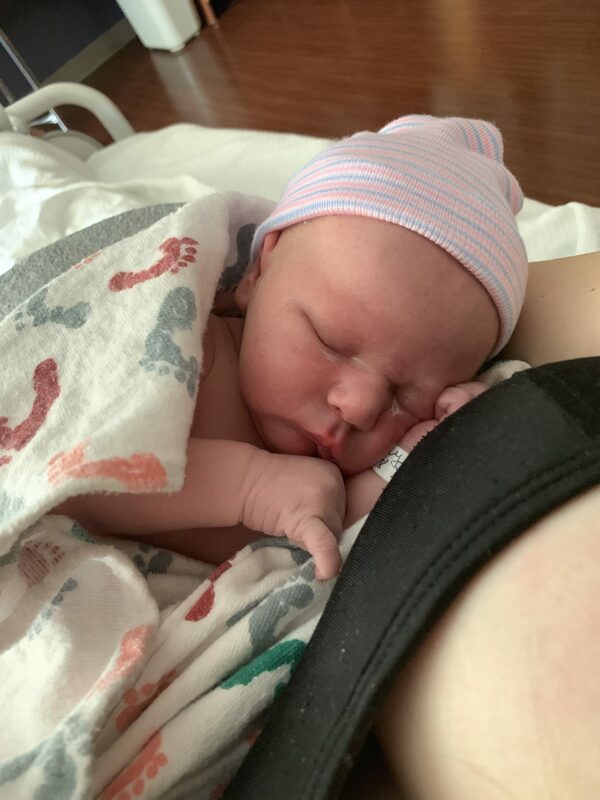 He was born at 10:18 AM (remember I arrived at the hospital at 9:30 AM!!) on Friday, March 15th. 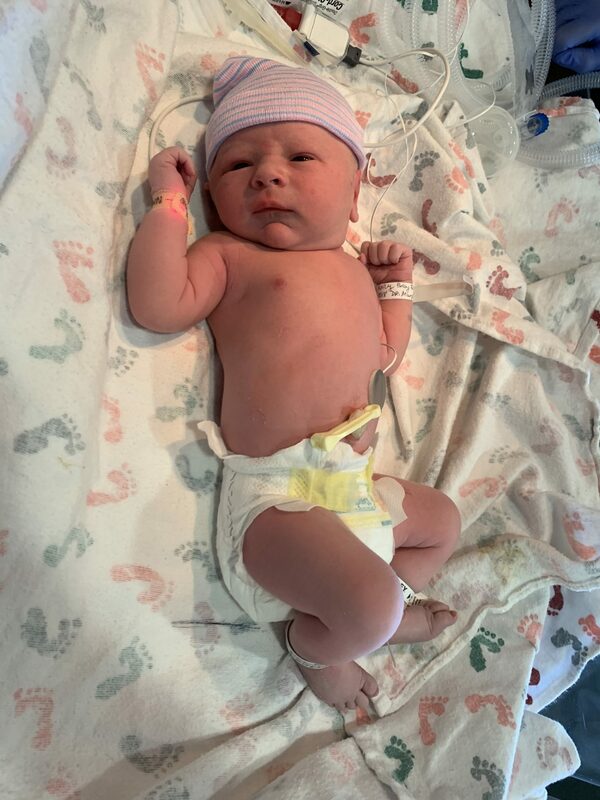 He was 7 lbs 12 ounces and was 20 inches long! I was so exhausted after laboring all night but somehow I felt more like myself than I remember feeling after Aria’s birth. I felt very aware and it was also nice that I could feel my legs, haha. I was up walking around within 30 minutes! 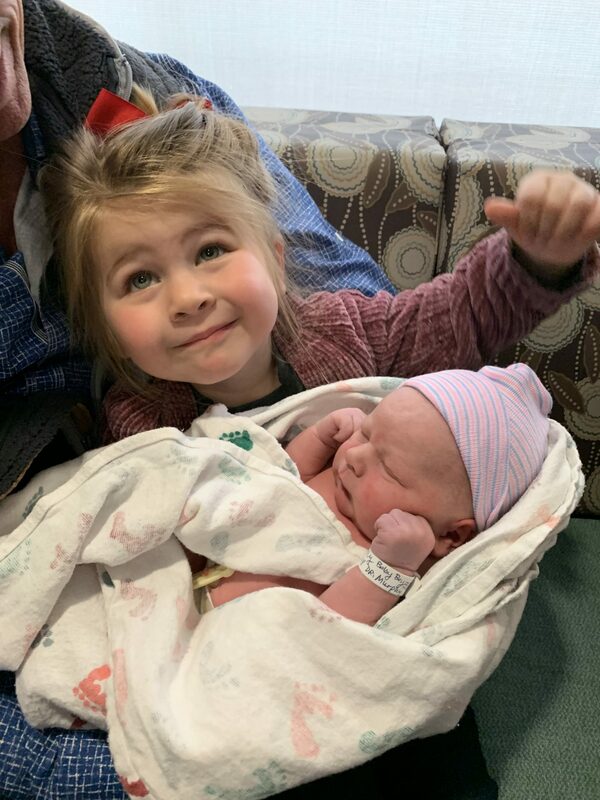 Finally, my parents brought Aria in who was SO excited after seeing the picture of her little brother that Blake had texted my mom. 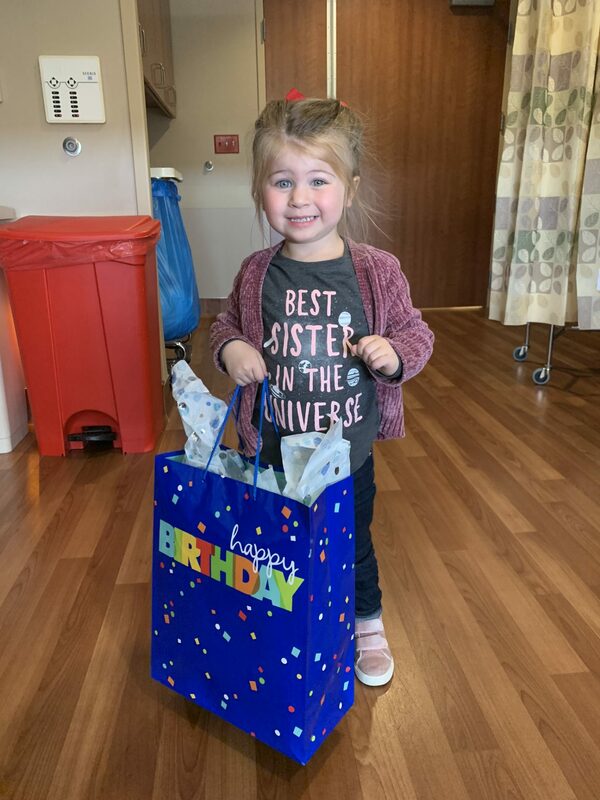 She was so sweet and gave him a “special birthday gift” just from her that I had put together for her a couple weeks ago. She was incredibly sweet and gentle and it filled my heart with so much joy!! After that we got our stuff together and headed to a recovery room, to which I thought I would be fine walking to but I was definitely wrong and got really light headed and dizzy. Thankfully the nurses were there to catch me before I fell to the ground and put me in one of their rolling desk chairs, haha. Yeah, not the best idea on my part. 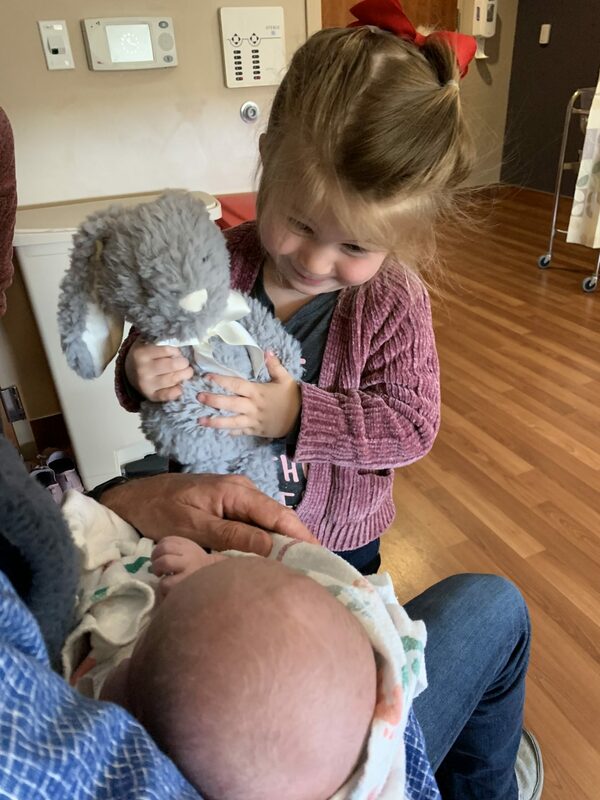 Once we got settled into the recovery room I ordered a big chicken sandwich and fries and got to hang out with Aria and more family, while enjoying our first moments as a family of 4! 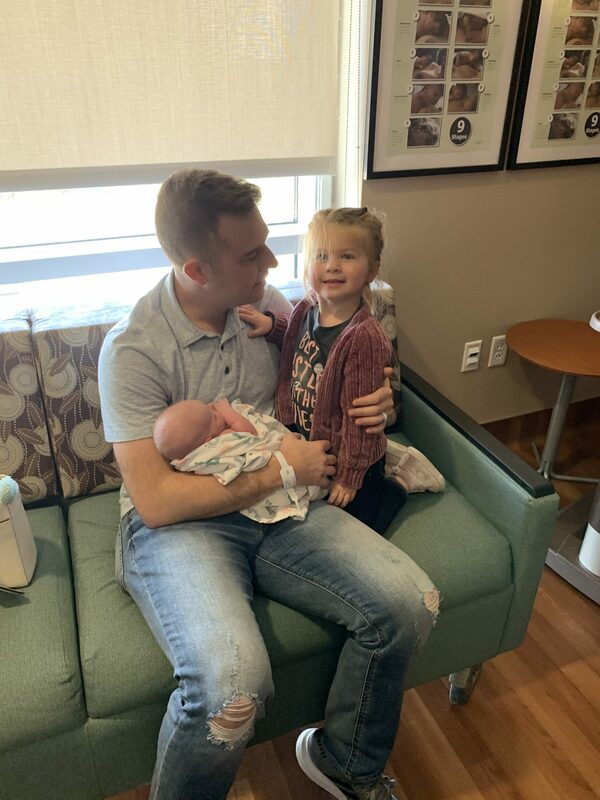 My nurses told me my labor reminded them of a scene from Knocked Up, Blake said he felt like a racecar driver trying to get to the hospital on time, Aria may or may not think her mom is a crazy person, and I am still in disbelief that I actually survived a natural labor. It was a whirlwind, with so many different emotions from everyone involved, and that is what makes it so special. 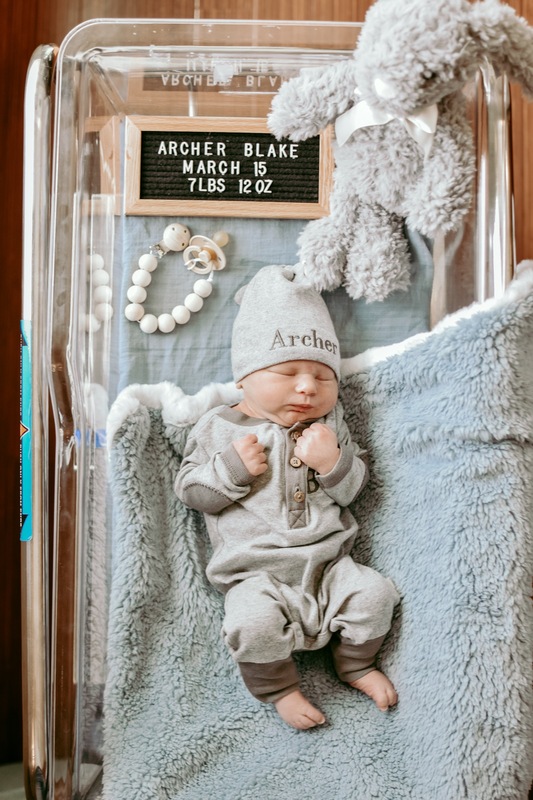 It was wild, it was scary, it was comical (to some people haha), but most of all it was the incredible story of how Archer Blake, our first son, made his appearance on this Earth. 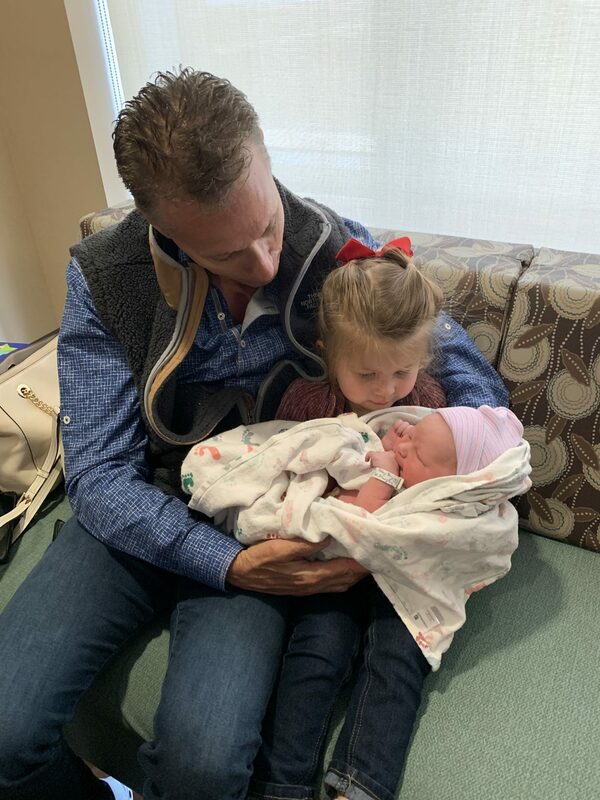 We are blessed beyond belief and look forward to sharing the adventures of our sweet little family of 4! Oh my goodness….crazy crazy CRAZY! 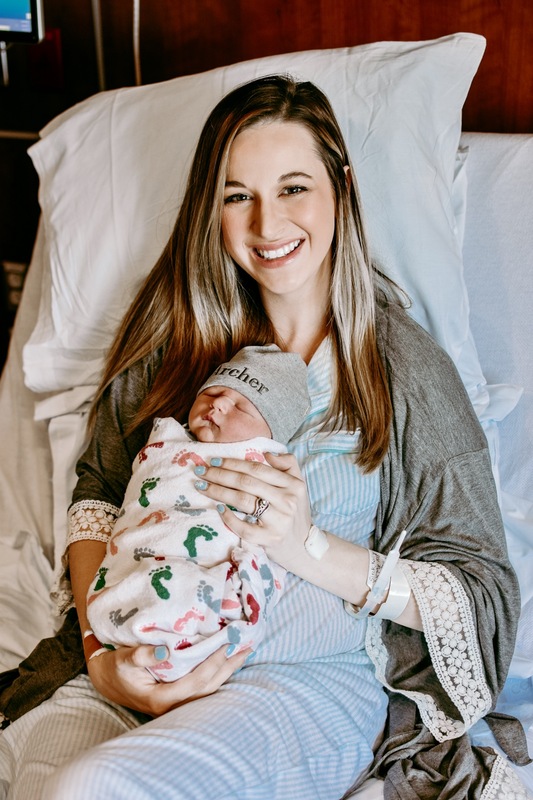 You are such a strong mama! 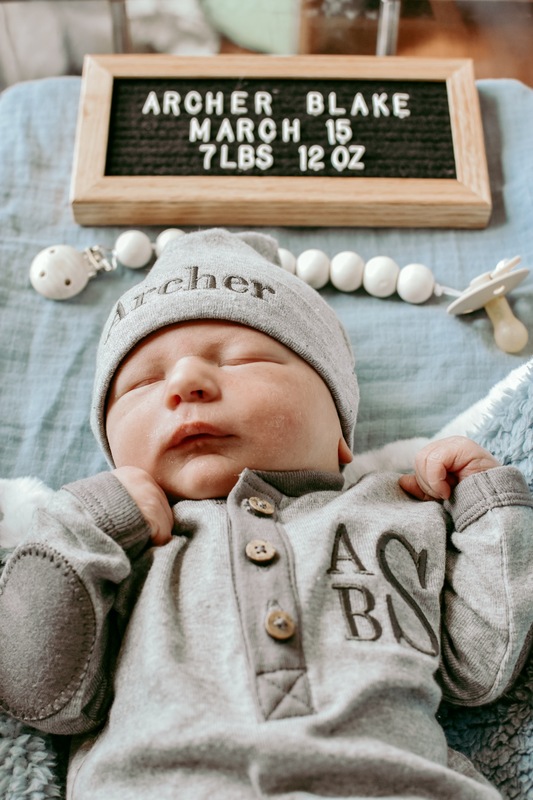 Welcome to the world, baby Archer! Oh my sweet goodness! This had me in tears!! What a strong mama you are! Congrats on your beautiful family.